The city that never sleeps. The Las Vegas strip is the louder, lively, bigger and brighter than anywhere else. 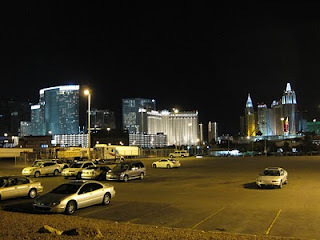 Many of the largest hotel, casino and resort properties in the world are located on the world famous Las Vegas Strip. 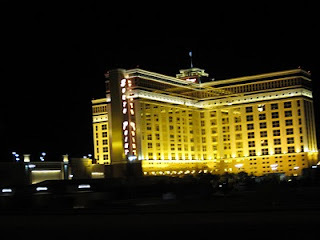 Nineteen of the world's twenty-five largest hotels by room count are on the Strip, with a total of over 67,000 rooms. 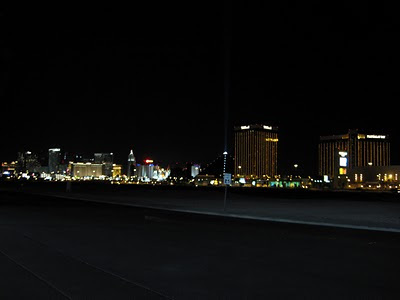 The strip is inked as "All-American Road". It is approx 6 KM long. 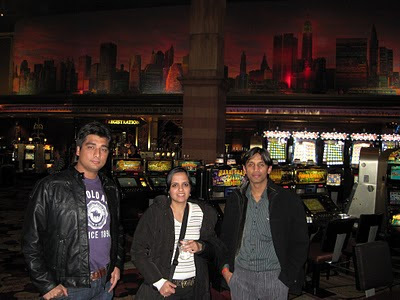 I got the time to visit Las Vegas with my amdocs collegues during christmas holidays. 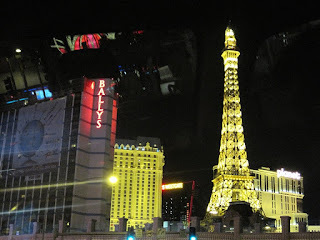 It was a herculean task for me to summarize the whole Vegas Trip, in a single post. Also it was a hard nut to crack to in/exclude the snaps from the pile of snaps, we have taken during our LV trip. Even I always given emphasis on selected snaps, so that the post reader / album viewer shouldn't get bored of that. So, I have given the city visit a binary flavour, In the day-light and during the dark-night. It is also a co-incidence that I am publishing this article on a binary date 10/01/10 (10th Jan'10). So here begins the dark-night in Las Vegas. Enjoy Day-Light in Las Vegas here. It started with our arrival from Seattle late-night. We got the Hummer, our throughout trip Humsafar (companion). 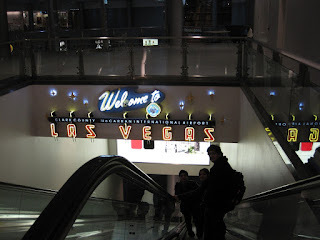 We got re-freshed, throw our luggage at our hotel, and roam around the Las Vegas Strip. The Las Vegas Strip (Map taken from lasvegasphotoimages.com) covers the places like, Luxor (Pyramid shaped with sky-talking light), The Hotel and Mandalay Bay (Golden Hotel), Tropicana, NewYork-NewYork, Monte Carlo, MGM Grand, Bellagio, Caesars Palace, The Mirage, Flamingo, Casino Royale, Harrah's, Venetian, Treasure Island, WWF Hotel, Las Vegas Hilton, Stratosphere and many more. Soon we parked our Hummer at Newyork-Newyork Casino, and take round of the this hotel and Casino. Throughout the Casino, There were many gaming tables like, BlackJack, Roulette, Poker and some non-unstandable games for us as well. Other than that there were many slot machine games as well. Las Vegas, is not just for the gambling, There are many renowned events happening throughout the calendar year. Many famous bands, groups, artists perform live here. So, Don't forget to get your copy (Monthly events in Las Vegas) from the airport or your hotel. Enjoy the StratoSphere, the tallest freestanding observation tower in the United States. You will experience the extreme thrill and rides. Even after listening about these thrills, I got goosebumps. During the night, You can also enjoy the refreshing Bellagio fountains. Though, We missed it due to its timings. Explore another nearby place, A Journey to Hoover Dam. Want to enjoy a Day-Life in Las Vegas. Money Money!!! Casinos!! everywhere, This is all about this place. Nice snaps.